“Cradle-Song at Twilight,” by Alice Meynell, appeared in The Saturday Review on July 6, 1895, No. 2071, Vol 80. According to the Waterloo Directory of English Newspapers and Periodicals, The Saturday Review circulated about 10,000 copies on average, published every Saturday, at 6 d (6 pennies). Selling at a higher price, The Saturday Review generally appealed to middle- and upper class highly educated Victorians, particularly classically educated males with conservative leanings. The inclusion of Meynell’s maternal poem seems slightly unusual for a newspaper that “assumed for a fact that women were inferior to men” and upheld the notion “female nature, mental as well as physical, is essentially receptive and not creative” (Thompson 19), and thus, the belief that women should not write. However, on occasion, they included poems written by females. With this knowledge, Meynell seems to slip in her poem, questioning Victorian ideals of motherhood, right under the noses of the editors of the Saturday Review, disguising it as a safe “Cradle Song”, but ultimately sending a feminist message straight to the heart of masculine and misogynistic print culture. The Saturday Review includes the “Cradle Song at Twilight” succeeding a poem by John Davidson entitled “Sunset”, which sets the sleepy and melancholic tone for the newspaper’s poetic break. With the night setting in, as established by Davidson, Meynell’s poem follows with what seems to be a harmless lullaby. However, the poem is itself an unconventional challenge to Victorian notions of motherhood. Meynell writes her poem as a ballad, evoking the lyrical nature of the cradlesong alluded to in the title. However, the poem has a curious turn, as the nurse referenced in the poem seems to be none other than the “slender night” (l 2). The night’s cradlesong does not succeed in lulling the child to sleep, and the nightly nurse sighs for other “playfellows” (13). Linda Peterson speculates that “the other playfellows” are “perhaps lovers” (Peterson 199), as this “unmaternal” (Meynell 7) young nurse resists her expected role. The nurse’s “alien eyes” (8) mentioned at the poem’s conclusion, suggests the distance and coldness the night feels towards the young child. According to the Oxford English Dictionary, “Alien”, in the 19th century, referred to making one “averse, hostile, or unsympathetic to someone or something” or “belonging to another person, place or family” (OED Alien). In the poem, the night becomes a metaphor for the nursemaid to express the nurse’s feelings of hostility and un-familial distance towards the child. Meynell evokes the traditional gendering of the night as female, and contrasts the cold nightly nurse against the expected notions of feminine warmth and compassion as maternal beings. Meynell calls attention to the fact that the chilled female night resists the role of nurse or mother, suggesting that maternal feelings are perhaps a social construction and not innate to each woman. 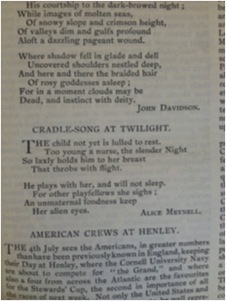 Thus, “Cradle-Song at Twilight”, despite the conservative male readership of The Saturday Review, nevertheless achieved publication as Meynell craftily slips in her unconventional lullaby, and conveys a curious play on Victorian notions of motherhood to the conservative male readership that perhaps needed to read it most. Cooper, Thompson. Men of the Time: A Dictionary of Contemporaries, Containing Biographical Notices of Eminent Characters of Both Sexes. 8th ed. London: George Routledge and Sons, 1872. Peterson, Linda H. Becoming a Woman of Letters : Myths of Authorship and Facts of the Victorian Market. Princeton, N.J. ; Oxford: Princeton University Press, 2009. Print. Worzala, Diane. Review “Woman Against Women in Victorian England: A Life of Eliza Lynn Linton.” VPR 22:2 (Summer 1989): 84. “The Saturday Review,” The Waterloo Directory of English Newspapers and Periodicals: 1800-1900. Web. 15 October 2013.